Richard A. Muller, Calvin and the Reformed Tradition: On the Work of Christ and the Order of Salvation. Grand Rapids: Baker Academic, 2012. 288 pp. $31.99. Reading Richard Muller’s work is always intellectually demanding yet educationally rewarding, especially for those interested in the role historical contextualization plays in understanding the thought of past theologians. Calvin and the Reformed Tradition: On the Work of Christ and the Order of Salvation is another superb work of historical theology from Muller’s pen. The book is a collection of essays devoted to the doctrines of the saving work of Christ and the order of salvation from the Reformation in the 16th century to the age of high orthodoxy in the 17th century. Here the reader will find discussions about a variety of subjects, from methodological generalities in chapters 1 (“From Reformation to Orthodoxy”) and 2 (“Was Calvin a Calvinist?”) to highly specific analysis in chapters 5 (“Davenant and Du Moulin: Variant Approaches to Hypothetical Universalism”) and 8 (“Calvin, Beza, and the Later Reformed on Assurance of Salvation and the ‘Practical Syllogism’”). At first glance the book gives the impression its intended audience is limited to those acquainted with Muller’s previous work and conversant with certain theological concepts and the debates flowing out of them. And there is validity to that assessment inasmuch as Muller presumes his readers aren’t completely uninformed about Reformed theology. Nevertheless, an attentive reading of the preface and first two chapters would suffice to introduce Muller’s overall thesis and methodological structure to those unaware of them. 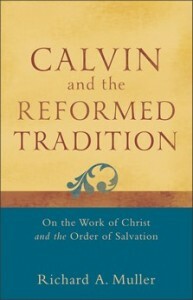 The basic argument in Calvin and the Reformed Tradition is essentially the one Muller has proposed and developed in previous works: the Reformed tradition isn’t a monolithic movement in which Calvin is the ruling theologian whose theology dictates the conceptual continuities and discontinuities of the whole. In particular, Muller, professor of historical theology at Calvin Theological Seminary, contends the doctrinal accounts from the Reformed divines about the work of Christ and order of salvation cannot be properly assessed if caricatures are used to evaluate concepts like limited atonement, hypothetical universalism, and union with Christ. Muller reacts against those who have read Calvin and his successors through unfounded assumptions such as the “Calvin against the Calvinist” theory that places Calvin’s humanistic theology in opposition to his “Calvinist” successors, who succumbed to the perils of scholasticism, eventually resulting in dead orthodoxy. Another common flaw is the practice of imposing a single subject as the controlling factor for the content of others—often assuming predestination to be the favored central dogma. The core of the argument in Calvin and the Reformed Tradition is supported by two essential considerations: a methodological correction and its application to the thematic analysis of particular theological subjects. First, the methodological correction addresses the “master narratives” adopted by previous scholarship in regard to the development of thought from the Reformation to the era of Protestant orthodoxy. The problem with these master narratives, Muller contests, is twofold: (1) they are based on “broad theological generalizations” imported from post-Enlightenment times and thus alien to the theologies of Reformation and post-Reformation divines; and (2) they are grounded in particular philosophical assumptions arising from a post-Kantian view of modern history. The result is an acute disjunction between Middle Age and Reformation thought based on an alleged antithetical relation between scholasticism and humanism. Calvin’s theology is accordingly depicted in purely humanistic colors—in opposition to its scholastic antithesis—as the exclusive explanation of doctrinal developments from the Reformation to Protestant orthodoxy. In the process, several relevant Reformed theologians such as Heinrich Bullinger, Pierre Viret, Wolfgang Musculus, Andreas Hyperius, Peter Martyr Vermigli, and John à Lasco are commonly ignored. Muller futher applies his methodological correction to the study of several historic theological texts concerning the work of Christ and order of salvation within the Reformed tradition. He points out the shortcomings of looking merely for conceptual continuities and discontinuities according to the “Calvin against the Calvinists” theory, particularly when theological agendas drive the whole project. Instead, we should situate Calvin’s thought in its own context and analyze it in relation to the thought of his contemporaries. Only then can his theology be rightly seen to be part of an ongoing development rather than the ultimate or final product of the Reformed tradition. In sum, Calvin’s thought should be viewed as an enlargement of the thought of pre-Reformation thinkers—just as the thought of Reformed orthodox thinkers should be viewed as an expansion of the thought of Reformation-era theologians like Calvin. Overall, Muller accomplishes his goal of demonstrating that—contrary to popular belief—the Reformed tradition of the 16th and 17th centuries, far from being a monolithic tradition ruled by the theology of one figure, was a movement that experienced internal developments resulting in legitimate doctrinal nuances. Additionally, Muller rejects what he considers to be a mistaken use of terms like “Calvinism” and the popular but misleading acronym “TULIP” to describe how Calvin’s theology relates to the rest of the Reformed tradition. Muller is right in pointing out that indiscriminate use of the word “Calvinism” in modern theological and philosophical discourse has led to a distorted view of the Reformed tradition. Similarly, he warns of the perils involved with not controlling our anachronistic impulses when reading ancient theologians; for example, when the remote question of “limited atonement” is pressed too much for answers in Calvin’s theology. Indeed, Calvin occasionally addressed the subject of Christ’s redemptive work in its objective extent and subjective applicability. He does so by recognizing—with certain qualifications—the medieval distinction between the sufficiency of Christ’s saving work for all and its efficiency for the elect alone. Calvin’s thought here is best explained by framing it within the idea that Christ’s sacrifice is “propounded” to all without distinction but “extended only to all the elect.” As prominent as Calvin is for the Reformed tradition, Muller rightly contends based on the historical evidence that Calvin’s formulation is but one out of several ways of explaining Christ’s sacrifice in the Reformed tradition. In sum, Calvin and the Reformed Tradition persuasively continues Muller’s magisterial work on historical theology. It is well documented and comprehensive enough to validate its major claims and theologically able in the description of the historical material discussed. There is still, however, one explanation missing in Muller’s superb project: how can the dogmatic theologian construct his theology while sustaining a meaningful dialogue with the theologians of the past? How should the theologian employ the work of the historian in constructing his theological discourse? Muller certainly wouldn’t deny the role of systematic theology; after all, his work—though historically driven—is based on the work of theologians who sought to coherently articulate the Christian faith, with Scripture providing the epistemic foundation. However, it’s not altogether clear in Muller’s project how we should integrate history and theology without sacrificing one at the expense of the other. ​Julián Gutiérrez is a PhD divinity student at St. Mary’s College, University of St. Andrews in Scotland. He is a graduate of the University of Aberdeen (MTh) and Talbot School of Theology (MA). Julian is a member of Bon Accord Free Church of Scotland in Aberdeen, where he lives with his wife and two children.